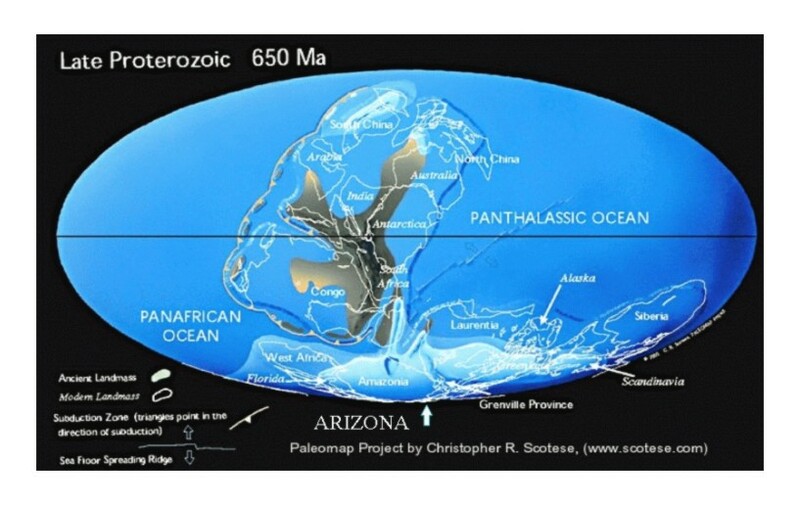 Approximately 650 million years ago, the place that would become Arizona was at the South Pole and the place that would become Antarctica was on the Equator. Geologists classify that time as Precambrian, a time which extends from the beginning to about 542 million years ago. The Precambrian, therefore, represents about 80% of geologic time. The Precambrian is divided into two eons, the Archean (rocks older than 2.5 billion years) and the Proterozoic (rocks from 2.5 billion to 542 million years old). In the current classification, there are no Archean rocks in Arizona (although rocks at the bottom of the Grand Canyon were originally assigned to Archean time). See geologic time scale here. Archean rocks form the Craton (basement or earliest stable part) of the North American Continent. These rocks underlie Canada and the northern Rocky Mountains. Arizona formed at the southern edge of the craton by several methods. As tectonic plates ground together and separated, they produced volcanos, island arcs, intrusions of magma, and sedimentation in shallow seas, all of which would eventually build the continent. Most of these rocks became metamorphosed due to the heat, pressure, and shearing of one plate grinding against another. Precambrian metamorphic rocks crop out in a belt extending from northwest Arizona near Lake Mead, through Kingman, Prescott, and Globe, to southeastern Arizona near Wilcox. There are scattered outcrops trending west from Tucson to Yuma. In mid-Proterozoic time (1.7- to 1.1 billion years ago), things quieted down and there was deposition of sediments and volcanic rocks in shallow seas between land masses. These rocks remain relatively undeformed and only locally metamorphosed. They are exposed principally in the mountains north of the Salt River, near Globe and Miami, Mammoth, and in the Catalina Mountains. This series consist, from oldest to youngest, of the Pioneer Shale, the Dripping Springs Quartzite (a hard sandstone), The Mescal Limestone and a capping basalt flow (the volcanic rock that built Hawaii), which together are called the Apache Group. The Apache group is overlain by the Troy Quartzite which is intruded by Diabase along the sedimentary layers. Diabase is crystalline subvolcanic rock similar to basalt. The Mescal limestone, which has been metamorphosed to dolomite (magnesium carbonate rather than calcium carbonate), contains some of the oldest fossils in Arizona: calcareous algal mats called stromatolites. Oxygen isotope data indicates that certain cherty parts of the limestone originated in ocean water with temperatures of 25- to 30 degrees Centigrade (77-86 degrees Fahrenheit). After deposition and consolidation, the Mescal was lifted above sea-level and intense weathering created caves and sink holes. This process continued even as river-borne (fluvial), and wind-blown (eolian) sands of the Troy Quartzite were being deposited. In the Grand Canyon, the Vishnu Schist is the equivalent of the earlier metamorphic rocks, and these are overlain by equivalents of the Apache Group and Troy Quartzite, but have different formation names. Precambrian rocks, principally those in Yavapai County, contain significant mineral deposits. 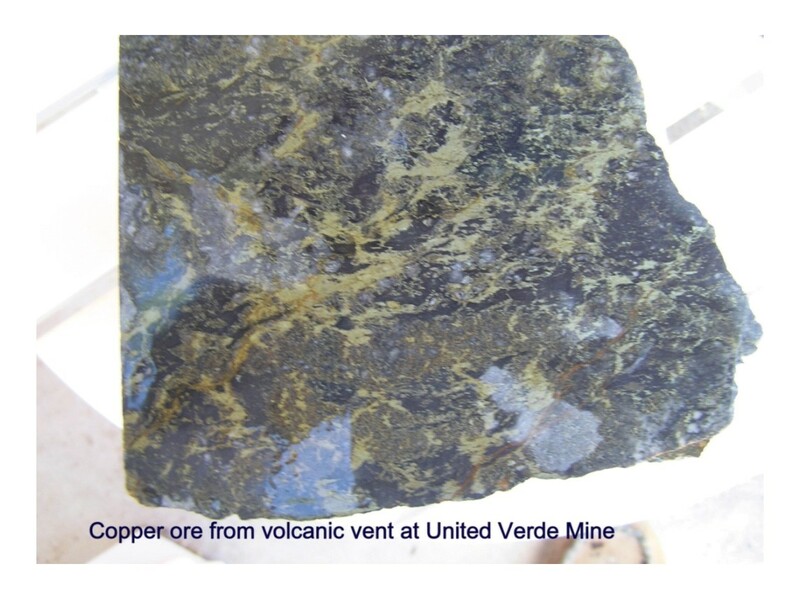 The best known of these is the United Verde mine at Jerome. These deposits, about 1.7 billion years old, are called volcanogenic massive sulfide deposits. They formed from under-sea volcanic vents that erupted hot, sulfide-rich material into the ocean water which caused cooling and precipitation onto the ocean floor. Similar mineral deposits are forming today. 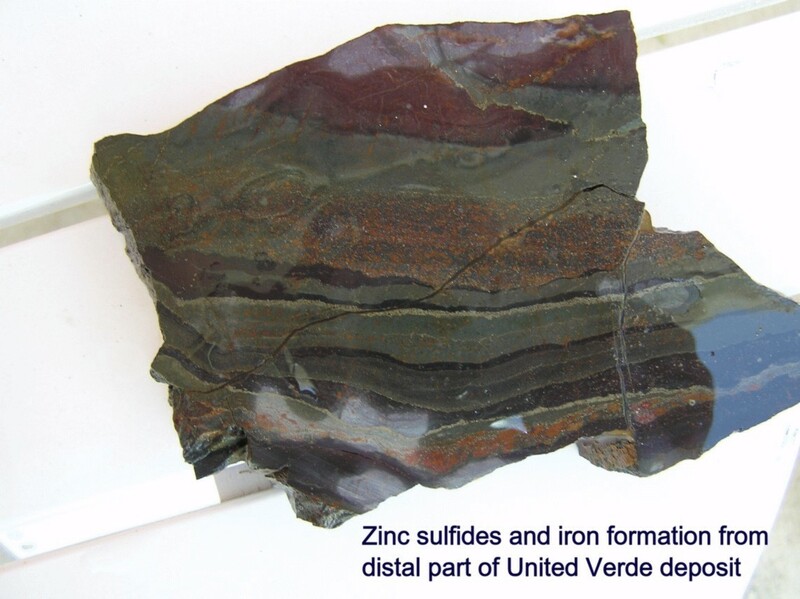 These deposits are rich in copper and zinc with lesser lead, silver, and gold. he Dripping Springs Quartzite contains uranium minerals along fractures and bedding planes. In other Precambrian rocks, there are vein deposits of gold, sometimes with base metals, tungsten deposits, iron deposits, and asbestos deposits (the mineral is chrysotile, the not so dangerous kind of asbestos). The division of Precambrian time into two eons, the Archean and Proterozoic at 2.5 billion years ago marks a profound change in the atmosphere. In the Archean, bacteria were the only known life-form. Bacteria take in carbon dioxide and give off oxygen, and about 2.5 billion years ago, that caused an environmental crisis. By that time bacteria had used up much of the carbon dioxide in the atmosphere and the planet was thrown into a profound ice age that lasted for about 30 million years. The bacteria retreated to equatorial habitats and to warm volcanic vents. Populations became isolated and some changed; they became more organized into a new life form called Eukaryotic microbes. The Eukaryotes had discrete cell nuclei and chains of protein to organize internal structure. The Eukaryotes would eventually become animals, plants, and fungi. Also at that time, oxygen levels in the ocean reached some critical level which caused iron and manganese to precipitate. All of the world’s large iron deposits, called Banded Iron Formations, formed between 2.5 and 1.8 billion years ago, and none have formed since.